Computers. Computers are one of the modern day gadgets that either thrill one or lead one to want to throw it out with the trash. We were raised with lead pencils, paper, and inkbottles in the corner of our school desks. That’s right. There was a little round hole in the corner of our desks to hold the bottle of ink for safekeeping. We had to unscrew the lid and fill our fountain pens with…get this…real liquid ink. Now I can sit almost anywhere and explore the wide world of information and entertainment on my phone or I Pad. This story is about a chalk drawing and how a computer helped in restoration. In October of 1960, at the State Fair of Texas, Dallas—my younger sister, Judy and I accompanied our older sister, Joan, to have a chalk portrait drawn of her. 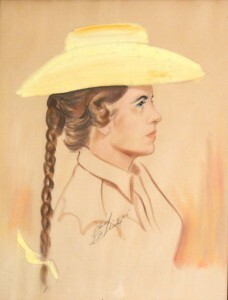 We had watched for years as the artists set up, near Big Tex, under tents and drew portraits and caricatures of people. Attired in her yellow hat and outfit, we headed to the one authentic Indian artist. His name was Chief Bird…or at least that’s the name he signed and drew a small bird. When it was her turn, Joan told him what she wanted. He glanced at her and said, “You’ve lost one of your earrings.” Her hand immediately went to her ear and he laughed. Both pieces of jewelry were still there. He explained he did this all the time and always got the same results. This is part of the history of the painting. Joan lost her battle with cancer on September 1, 1994. The portrait has brought comfort to us through the years, but we needed to share it with her five children. I have repeatedly tried to capture a likeness of the sketch with a camera…there was always a problem with the shot. 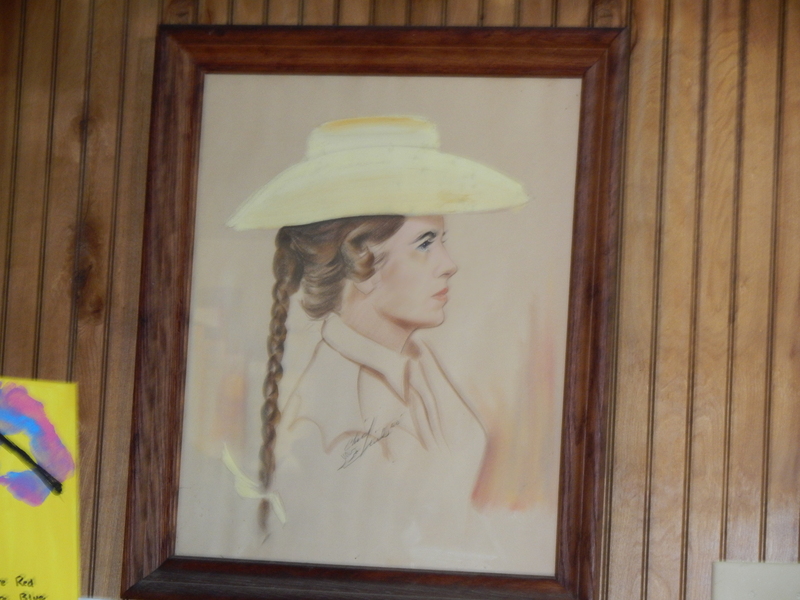 We were afraid to take it out of the frame since it is a chalk drawing and quite old, so what to do? I sat in a chair the other day, in the room with the painting, changing the card out of my camera. 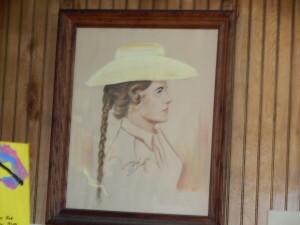 Glancing at the portrait, I snapped a picture—wow, looks pretty good. Took another shot—a little dim, but tried again. After downloading the photos on the computer, I hit the edit choice. After cropping the best, I found a problem. It was crooked. It could be because I sat in a chair, eleven feet away, diagonally across the room from the picture. Noticed a straighten icon. I wonder…undid cropping and tried that. Oh my, didn’t know you could do that. I moved the little bar and the photo magically straightened. Cropped once again. Looks good, but wait, there is another thing that says enhance. Figured it would want you to paint colors. Clicked on it. Am so glad that my chair has arms—I would have fallen out otherwise. The picture popped out at me. I cried. Regaining my composure, I sent the results ‘on line’ to the store to have various sizes of photos made to share. So from the days of little inkbottles in the corner of the desk, I can now send pictures through the air from the middle of the cow pasture. Logically, one would wonder why I didn’t feature the ‘before’ picture first, rather than the ‘after’ one. Take a look. I’m so proud of the finished product, I couldn’t wait to show it. I don’t think I even have a real fountain pen left, nor a bottle of ink, but I am learning with the help of a computer, in my old age, to create a whole new world to explore.